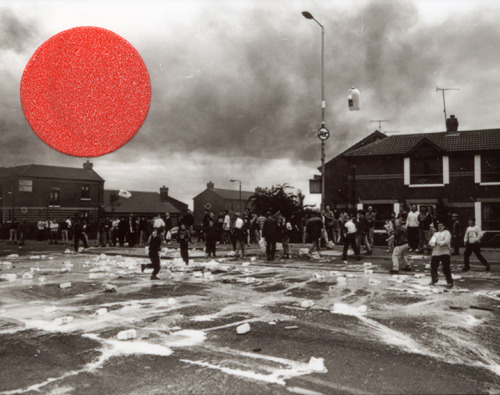 Photographers Adam Broomberg and Oliver Chanarin were commissioned to respond to the material contained in the Belfast Exposed archive, an archive that contains 14,000 black and white sheets documenting the troubles in Northern Ireland that started in the late 1960's. In this archive, whenever an image was chosen, approved or selected by an archivist, a blue, yellow or red dot was placed on the surface of the sheet as a marker. What these two photographers did, was to re-print the surface of the sheet covered by the circular dot showing only what was beneath it. The result of the intervention led to a collection of circular random sheets under the name "People in Trouble" that in a way captured the random gesture of the archivist and that have an essence of their own.